During his long active career, Steven Staryk was often termed the “King of Concertmasters,” having served in that capacity in orchestras on both sides of the Atlantic. Currently in retirement (though still quite active as a teacher and competition judge), he began compiling a 30-CD anthology drawn from recordings of some 190 major compositions that he made between 1952 and 2003. Released to the public as the “Steven Staryk Retrospective,” they reveal a concert artist who was remarkably true to himself. That goes double for these 1961-1978 Bach recordings. Whether “live” or made under studio conditions, it makes no difference. The Staryk sound is distinctively the same. For this artist, the music was the thing, and his grasp of the subject went well beyond the scope of the instrument itself. From the very opening of the Allegro of Bach’s Concerto No. 1 in A minor, recorded with Bernard Haitink and the Royal Concertgebouw Orchestra of Amsterdam in October, 1961, we pick hear the magisterial quality that led Gramophone to describe Staryk as “one of the great ones.” The string sound, richly burnished, has a definite sheen to it. The performance is scrupulously honest and straight-forward. Staryk prefers to let the music speak for itself, without any gimmicks, so that the heart-melting quality of the music in the Andante – and even more so, that of the Adagio in the sumptuously rich Concerto No. 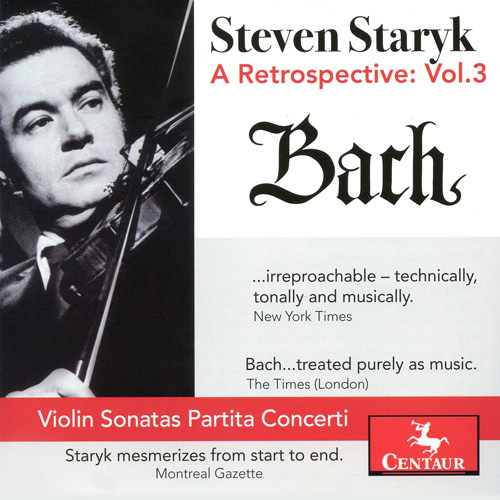 2 in E major, with Staryk serving as soloist and conductor of the Vancouver Baroque Orchestra in a 1975 studio recording – comes through naturally and unforced as an essential element of the music. The Sonatas for Violin and Keyboard in G minor, BWV 1020, and E minor, BWV 1023, were both recorded with harpsichordist Kenneth Gilbert. For once, there is an equal partnership in these (to my mind) much-abused and seldom-convincing works, as Staryk and Gilbert make telling contributions without either partner sacrificing his own distinctive artistry. Gilbert is particularly effective in the opening Allegro of BWV 1020. Again, it is the Adagio movements that make the most lasting impression, which is as it should be. Staryk’s account of Partita No 2 in D minor for solo violin is actually segued from two recorded performances. Movements 1-4 were recorded in London in 1962, and the fifth movement, Chaconne, in Toronto in 1978. There is some rationale for this, as the Chaconne, longer and more elaborate than all the previous movements combined, was not an integral part of a typical dance suite, or partita, but a set of harmonic variations on a repeated pattern from a ground bass. This Chaconne staggers the imagination in its seemingly endless wealth of inspiration and range of moods, from pensive to exultant, and even including an imitation posthorn call. Staryk explores it all with the utmost in concentrated power and insight that made his name famous. "How can one explain that this magnificent instrumentalist is not more the violinist of the general public, while his playing has the highest esteem with his colleagues!"